This statistic is fundamental to our understanding of the current economy. College graduates have jumped through the hoops that were supposed to give them a better life. They are supposed to have the skills that enable them to compete on the global economy. But something is going wrong. The fastest growing jobs now for young college grads include dental assistants, hairstylists, and bus drivers. The middle-skill jobs that young college grads generally take (think sales agents, teachers, and financial analysts) continued to shed workers in 2011. And for the few high-skill jobs actively hiring (think engineers, web developers, and computer support specialists) most college graduates still lack the necessary training. 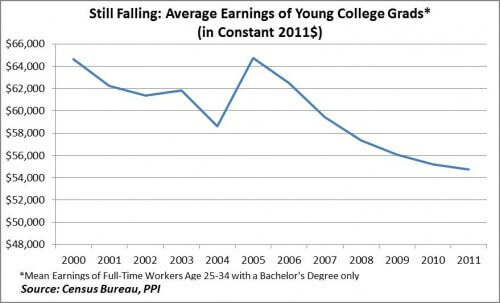 That leaves many young grads taking jobs that don’t require a college degree for less pay. I call this “The Great Squeeze” – as college grads take the lower-skill jobs, they squeeze out those with less education and experience from the labor market. Nobody wins. Given the prospect of falling real wages, coupled with rising college costs and debt, many young people are beginning to question the value of a college degree altogether. That means it’s essential whoever wins the election make the plight of young college grads a priority. Not making the investment in education is not the answer; ensuring there are better jobs upon graduation is.